Ramco Construction Tools | Constrution Tools | Hydraulic Hammers | Hammer Tools | Parts | Ramco Constrution Tools, Inc.
low cost of ownership and anti blank firing (MODELS TF 17-70). Ramco specialty tools fit most popular hammer brands. 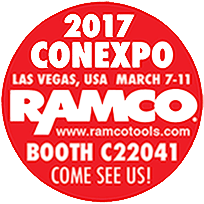 Ramco replacement tools and parts: Great variety, huge inventory and competitively priced. The patented demolition tool of choice for Bridges, Airport Runways and Concrete Structures. The world’s premier hydraulic hammers, hammer tools and parts. For nearly 30 years Ramco has specialized in hammer points and wear parts for most popular brands of hydraulic hammers. We manufacture Blunts, Chisels, Moil Points, Upper and Lower Bushings, Pistons, Retainer Bars and Pins. Ramco is the professional choice for the breaking and demolition of concrete, slabs and footings, rock, rock reduction, trenching and scaling. Designed for high performance, durability and low maintenance the TF Series breakers are both powerful and versatile, fitting a wide range of carriers and applications. Ideal for general demolition, concrete, quarry, primary and secondary rock breaking, reduction of demolition rubble for recycling, road construction, trenching, foundation work, tunneling, renovations and more! From 350 lbs. to 15,000 lbs. Ramco provides breakers for Mini Excavators and Skid Steer Loaders, small Excavators and Backhoe Loaders to medium range and heavy Excavators. Ramco’s TF Series breakers provide years of profitable service with a low cost of ownership. Ramco offers multiple grades of tools to satisfy the most demanding applications. Inquire about custom and specialty tools, our patented Slab BusterTM, Power SeriesTM, Pipe Drivers, Sheet Drivers, Tampers, Asphalt Cutters, Impact Cutters, longer and shorter than standard points and more. Ramco has the right tools for the job!